With the home opener one week away, Cardinals fans should be prepared for ramped-up security at Busch Stadium and allow extra time to walk through new metal detectors at all gates. Unlike at the airport, fans won’t have to take off their shoes and belts. But they will have to put their keys, cell phones and metal objects on tables when they pass through the detectors, says Joe Abernathy, vice president of stadium operations. The 50 detectors are being added in response to a new Major League Baseball policy that requires all stadiums to screen everyone who enters. In the past, ushers at Busch used security wands but were able to check just a small percentage of fans because the process takes too long, Abernathy said. 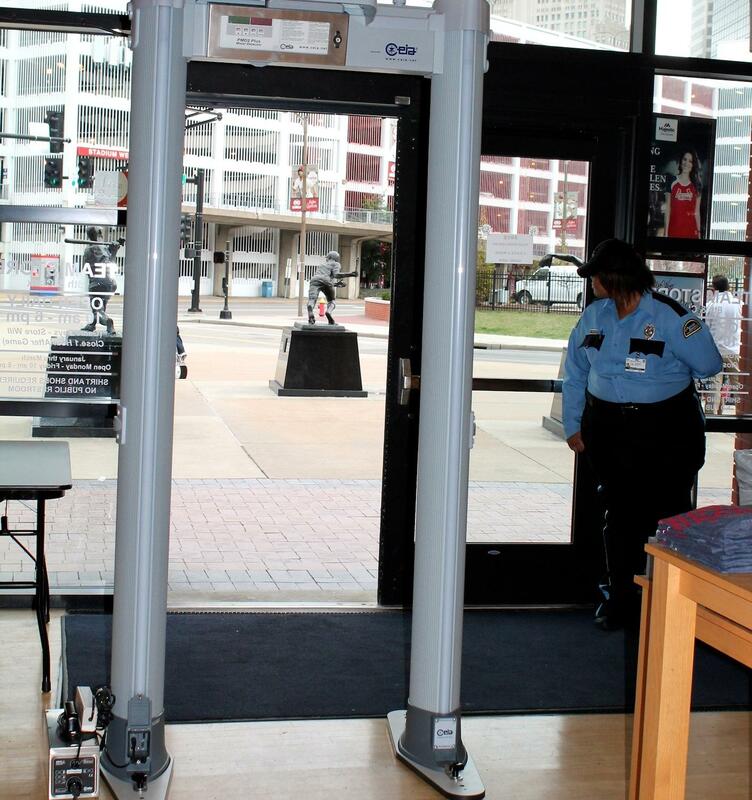 A new metal detector at the entrance to the Cardinals Team Store at Busch Stadium. “We have crowds of 40,000 and we’re doing it 80 times a year, so we thought it was worth the investment of getting the walk-through metal detectors,’’ he said. The stadium has added about 80 ushers to staff the units and to provide secondary screening should someone trip a detector. Abernathy warns fans that it will probably take longer to enter the stadium, especially on opening day, April 13. * Purses and totes do not have to be see-through. While the National Football League requires bags to be clear, Major League Baseball has not adopted that policy, Abernathy said. He urges people to only bring into the stadium what they will need. * No guns or weapons, obviously. * Fans can still bring food and plastic bottles of water and soda. No cans, glass bottles or alcoholic beverages. Small soft-sided coolers are allowed, if they will fit under stadium seats. * Fans can bring cameras, as long as they aren’t being used for professional purposes. * Smokers will be allowed to pass in and out of Gate 4 only.